#126* – EUkip Fabricates Lies As Evidence! MORE EVIDENCE THAT EUkip’s LEADERSHIP LIES & TURNS ON ITS SUPPORTERS! On Thursday 13-Nov-08, how very apposite that a betrayal would take place on 13th. – isn’t it also the anniversary of an apposite massacre of Danes in 1002 by King Ethelred (Ethelred the un-reedy – be minded his nick name was that he had no need of reed as he was so wise). I received a phone call from John West in some despair, having discovered that what I have been saying for a long time now is true. Not a pleasant certainty to come to for an honest man who had such hopes of UKIP that even until now he has followed every legitimate procedure to bring about change – in the misguided belief that the leadership, NEC and staff have betrayed the electorate, their supporters and these United Kingdoms going native as EUkip. Seemingly solely interested in the agrandisement of a chosen few who have seized control of UKIP and subourned and defiled it as EUkip – a corrupt and sordid organisation being exploited by the chosen few to keep their snouts in the troughs of The EU. I use my words and not John West’s. 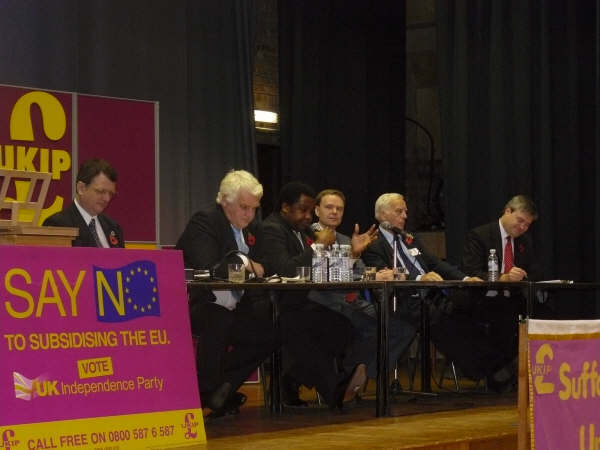 A panel line-up from left to right: Gerard Batten MEP, Mike Nattrass MEP, Delroy Young, John West, Derek Clark MEP, David Campbell-Bannerman (Deputy Leader and closely related to a Desk!). I wonder if John West expected an Immigrant (well hasn’t actually arrived yet) as Treasurer when he sat with the Great & The Good of EUkip at the Immigration Conference he organised for EUkip? Mr. West has contacted me having tried every other means that he believes available to him to defend his Country – be minded John West is a published historian, an archivist and a collector of British antiquities giving him a solid grounding and understanding of just what we are losing in these United Kingdoms by the odious misfortune of EU vassal status. That John West’s father was a long service Police Officer ensured an awareness and respect for Justice and due process and he has been advised and consulted Police friends of lifetime standing as he has made grave decisions about the future of EUkip. 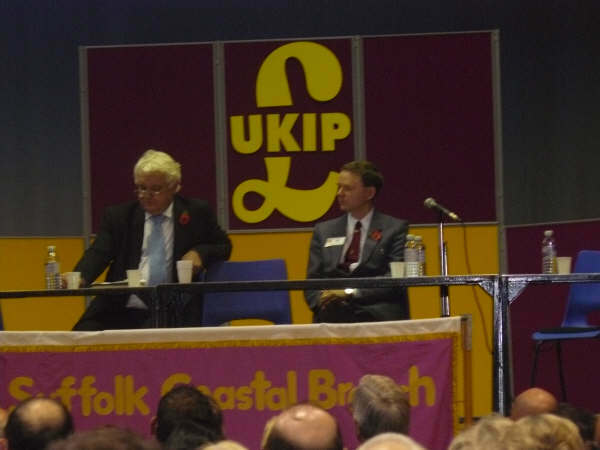 One wonders if John West had considered just how un-just EUkip had become, when he organised a Conference on Law & Order for The Party and the great and the good of EUkip came as speakers. Little did he know how soon they would bear false witness, organise witch hunts, orchestrate show trials nor I presume just how criminal they were prepared to be! Mr. West contacted me, he tells me, because he has come to the certain knowledge that, although some of my methods and wordings he would not use, maybe to get the truth out one must be as resolute, relentless and openly honest as I have proved to be. After discussion and in the realisation that by contacting me he can expect to be further lied about, defamed and threatened just as I have been over a prolonged period by the filth that has seized control of EUkip. John West then mailed me a .jpg of a letter he had received from EUkip via Nigel Farage’s unelected and salaried puppet Chairman Paul NuttAll – a worm of a man eho was happy to take advantage of corruption and duplicity taking the seat of a man who had resigned in disgust at the lies he had been bullied to put his name to. Shame upon you Paul NuttAll, what a creep and he wanders around in the EU boasting and speculating that if Farage falls he will become leader! Leader of what? EUkip is finished. Consider the truth – this is the sort of letter they are sending out. Unfortunately, I am today suspending you as UK Independence Party PPC for Ipswich North and Suffolk Central under rule 16.2 of the Constitution. The final decision regarding your candidacy will now be put before the NEC on December 15` 2008. I am also informing you that there have been a number of serious complains made against you, which have now been passed on to the Party Secretary. This is particularly hard for me as I have always found you to be hard-working and extremely likable. I also know that you still feel aggrieved by the You Tube scenario and demand an apology. I had a lot of sympathy for you in this matter and I am truly sorry that it happened. However, your behaviour since that instance has brought the party into disrepute. You reported the former leader of the party to the Police, without a shred of evidence; you show no remorse for your actions, even though the Police have said there is no case to answer and you now openly claim that the same individual is under investigation by OLAF, also without foundation. I hope you understand that I cannot allow this situation to continue. I will repeat that I like you John and have always supported you in the past, but I think you are being manipulated and used by some very unsavoury characters indeed. I therefore take this decision with a heavy heart. It is interesting that however you read this tripe there is not a shred of truth in the allegations made but much praise by way of apologia and it is clear that in carrying out his master’s bidding even the odious and insignificant little NuttAll is uncomfortable with what he has been ordered to do. Consider the fact that EUkip make much of hiring a Political Prostitute and whistle blower as a so called ‘Treasurer’ – a woman clearly without integrity as she has joined EUkip and is exploiting it for her own gain. Marta Andreassen has joined EUkip – a party with an unequivocal withdrawalist agenda, according to its members, yet she has made it clear she is pro EU and has fought it in the Courts to get her snout back in their troughs – she claims that it needs change from within. I must admit I agree and I would welcome a modern Guy Fawkes, to change it from within – however I feel that Andreassen may well have other ideas of change from within! The Worship of the Postulant Perchance? It is sad to see the hopes of Millions so treacherously betrayed by the arrogance, hubris, corruption and self seeking greed of the few! Let us hope that the majority in EUkip – the loyal UKIP members excercise their democratic right and hand these scoundrels over to the police, Electoral Commission, OLAF, HM Customs & Revenue and other appropriate agencies. Report their accountants & solicitors to their professional bodies and dump the balance – DO IT NOW already it may be too late. You will have noticed that for a Party with literally £Millions coming in that they have only £45,000 in the bank and income is falling like a stone. Fines, Forfeitures, Costs & Damages not withstanding. No doubt this is why they fear honest men and women so much and are trying to expunge them from the party and perhaps why they imported an alien part time treasurer – do not forget they did NOTHING about Tom Wise and not only is he still a member but until a couple of weeks ago he was still a Branch Chairman, a post from which he resigned! Consider the indisputable disrepute he brought the party into by the fact that he is under arrest and out on bail, is being investigated on numerous counts and has garnered a huge amount of adverse publicity in the media – furthermore I know, in some detail, what had to be cut from The News of The World video!